In light of the 532nd birth anniversary celebrations of Sri Chaitanya Mahaprabhu that have begun since 17 February this year, a detailed biography on this legendary figure finds even more relevance now. 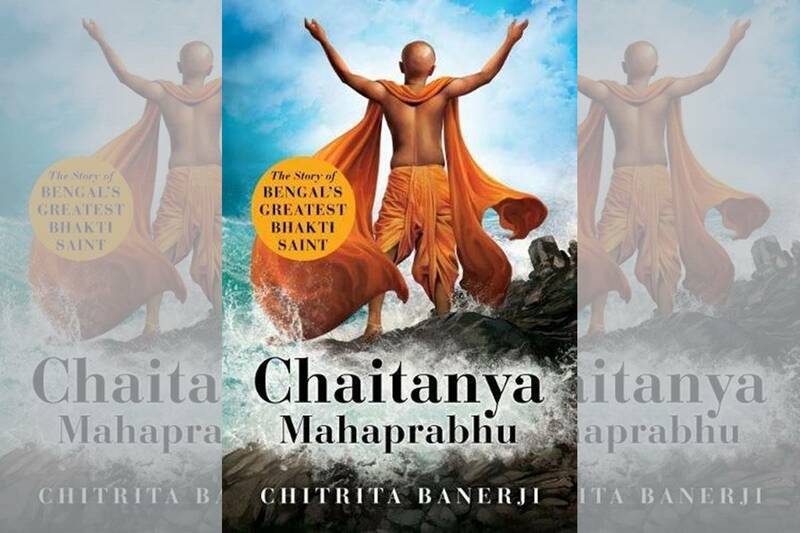 In this gently flowing narration on the life of Bengal’s renowned saint Chaitanya, Banerjee begins with a personal connect. Her grandmother being deeply spiritual, ‘kirtans’ were sung and prayers daily offered to Radha-Krishna in religious rituals in her house. On the wall of her prayer room, a painting of a man in “a saffron dhoti, scarf around his neck, his face raised to the sky, arms above his shaven head which indicated his monkhood” intrigued the author’s young mind; for though a man, he was worshipped with Lord Krishna. So the author’s grandmother explained to her about this mystical person who was born centuries ago in an ordinary Brahmin family but who experienced extraordinary revelations that made him transcend to a greater awareness of Krishna… so “potent and intimate” that it almost made him the same as Krishna. But how did this man become a “God”? Through the 200 pages of this book Banerjee explores and explains in sedate manner. There is calmness and detachment overriding the tumultuous life story of an extraordinary man. But she has done justice to the nitty-gritty details, right from describing the humble home environment, minute details of every family member, often including even the dishes cooked and consumed! The story begins on 18 February 1486, when Shachi gives birth to a beautiful baby boy, who is named Nimai after the neem tree outside the house. After the previous tragedies of losing her eight babies, Shachi is blissful and holds her newborn close to her heart. She has no clue that with time, this son will attain wondrous glory and his name will be chanted across the world: Chaitanya Mahaprabhu. Banerjee has moved along chronologically and for better understanding of the timeline has also written on the recorded history of the land. For instance, she mentions Turkish Bakhtiar Khilji of the 12th century, who established his stronghold in Bengal, and was instrumental in spreading Muslim influences. “By the time of Nimai’s birth… in Nabadwip, minarets of mosques compete with temple spires in the skyline…” She delves into the history of Nabadwip recounting how under the tolerant Muslim ruler Alauddin Hussain Shah, there is a “notable renaissance of Bengali culture” and the “emergence of a distinctive Hindu-Muslim style in art and architecture”. The culinary skills of Shachi are explored and details given of how she can turn the simple banana flower into a delectable dish; scenes from the humble kitchen, young Nimai’s pranks at school, how his brother Biswarup exerts the little discipline possible on him, all find apt mention. Then the family is dealt a bolt from the blue when Biswarup leaves home suddenly, renouncing the world to become a monk. Nimai is further devastated when his father passes away suddenly and has to face the responsibility of being provider. Instead, failing in this role, he makes unreasonable demands on his mother and turning violent, injures her when she can’t meet them. It’s a turning point and a remorseful Nimai decides to settle down and get married. He soon evolves into a teacher; yet his nature remains arrogant and disdainful. He leaves for Sylhet, where his father came from, to visit educational institutes; but on returning home after three months is shocked to find his wife has succumbed to snake bite while his mother lies in bed, stricken by grief. Life has once again dealt a blow, but since “a young man must have a wife”, Shachi, his mother persuades him to remarry. Bishnupriya, daughter of Sanatan a wealthy Brahmin scholar is chosen and Nimai’s life now continues in domesticated comfort. His extraordinary good looks make heads turn as he walks the streets, dressed in fancy clothes and garlands. Yet, he has strange fits of fainting; sometimes loudly proclaiming “I am he”. Who is this ‘he’, the people wonder. However, after recovering from these fits, Nimai resumes his daily routine. Yet, underneath it all, his heart is filled with anguish, mourning the loss of his father and his first wife. Banerjee recounts the ‘great metamorphosis’ when Nimai visits Vishnu Temple, the incredible experience is so intense that it renders him speechless. He “weeps and cries out the name of Krishna”. Around this time Nimai meets Ishwar Puri, follower of Madhabendra Puri, legendary Vaishnav practitioner. Ishwar Puri takes him under his wing and initiates him into the path of Vaishnav spiritualism. Nimai now slowly evolves into a leader. Banerjee elaborates this path, also mentioning the many sceptics and “non-believers” who ridicule him openly. Strangely, among the new members of the Vaishnav faith is a Muslim, who converts and becomes a Vaishnav; he is later known as Jaban Haridas. In the meantime, Nimai becomes a “star performer” in theatrical performances of the Vaishnav community. In fact, he sometimes plays the female role and is so convincing that even his own mother Shachi is fooled on one occasion! Banerjee has included every important person who was in some way or the other connected to Nimai, who was influenced by him, or vice versa. Yet, though he is the “unquestioned leader of the Vaishnav community”, Nimai remains an enigma, to even his closest friends. When he finally renounces the world, Shachi’s long-held anxiety comes true. Bishnupriya’s loss is permanent; she will never be a mother, none of her desires will be fulfilled. On 3 February 1510, Nimai is inducted into monkhood, his beautiful locks are shorn off in keeping with ascetic life and he’s given a new name: Krishna Chaitanya, the consciousness of Krishna. He has now become Chaitanya and the world will know him by this name henceforth. It’s June 1533, time for the nine-day Rathajatra festival that is held in all pomp and glory in Puri. His followers see his bouts of sorrowful tears, wonder what they portend and hope that the festival will lift their leader out of his melancholy.